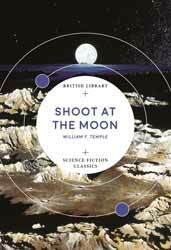 Shoot at the Moon (2018, originally published 1966. 238 pages) is a science fiction parody, by the much overlooked British author William F. Temple. Although the story treads through many of the well-worn tropes regarding inaugural trips to the moon, Temple places his own humorous slant on proceedings. Brunel is a weary misanthrope, not at all impressed that the new engine will essentially replace him; much of the humour derives from his interactions with the mismatched crew, all of whom have peculiar backstories. They appear to have been chosen for the same reason as contestants on Big Brother, in that they are all a little bit odd and in many ways oddly broken. The first of the crew, Marley, is a blustering throwback to a nineteenth century entitled bully. It is through his political will that the ship is constructed, having both the force of personality and connections to get the British government to fund the ship. I do not think that the choice of this character or the fact that in the book the British still have an Empire are by chance, when in reality this was no longer the case in 1966. With these two elements Temple is gently mocking the stories and characters of Verne and Wells. Lou is Marley’s daughter and the object of romantic interest for Brunel. It is usual in these cases for the female to be an object, possibly of chaste interest, but not so Lou. When Brunel first meets her, in Marley’s home, she behaves like a child and he takes a great dislike to her, especially when he discovers that she will accompany them to the moon. But Lou is a fractured character with multiple personalities. The adult Lou is a lusty creature, in a way that young ladies are not supposed to be in these stories. She also has her scientist persona, all steel and cold logic. The last members of the crew are the doctor, who turns out to be Lou’s ex-husband, who still harbours feeling for her and Pettigue, a scientist who has the singular distinction of being the only survivor regardless of what expedition he is involved in. The first half of the book has the crew prepare for their momentous journey and Temple has a lot of fun with their personal interactions. The book then changes. On the moon it turns into a murder mystery and Temple has conveniently given everyone a reason to want to see other crew members dead. As the deaths mount up Temple has one last trick to play and I guarantee you will never guess the real culprit. It’s a weird book, with its swings between light and dark, between the absurd and the deadly serious, but it does keep you on your toes and delivers a real surprise in its ending.